This past week my little girl was all about having two ponytails. Surprisingly, I was okay with that since few things say little girl to me like two little ponytails. I'm sure there will come a day, in the not so distant future, when she will no longer let me fix her hair or she may even want her hair cut (Gasp!). So for now I will gladly continue to wrestle her abundant, squirrelly, curly hair into two teeny tiny elastic bands without gritting my teeth and screeching toholdyourheadstillstopturningyourheaddon'tsquirm. I will. With a little help from Above. On another note, this scene from the refrigerator tickled my funny bone. Seems Annelise could only eat half of her banana so she put a clip on it (like we do our cereal and chips) and popped it into the fridge. Problem solving by a five year old. Love that. OMG......that child is watching your every move. She is so observant. And thrifty! A. has such gorgeous hair...if she ever wants to get it cut, I'll gasp! 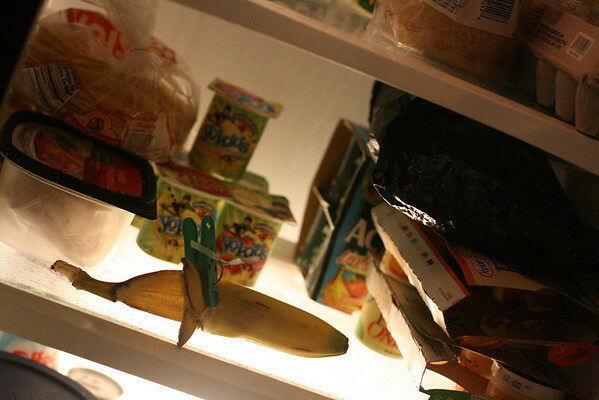 Love the clip on the banana. Too cute! If Gracie doesn't finish something, she always wants to "save" it....good? bad? hmmm....G is either thrify or a pack rat! (I fear the latter....!) Have a great Monday!!! sweet girl!! 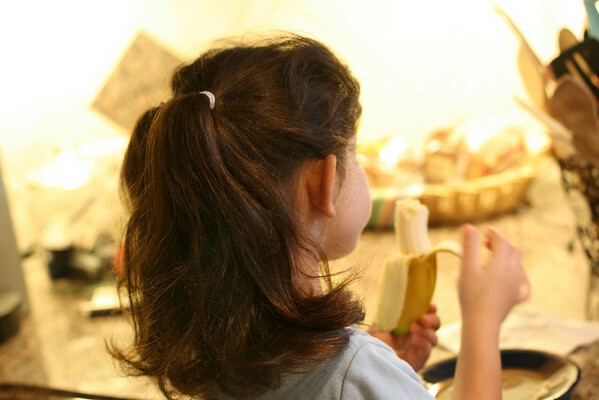 I just love her ponytails...and her solution for the banana! She's smart...like her mama! The clip on the banana was too cute, and smart I bet there was no blackness on it. The ponytails are so cute, I love the little-girlness of them. She's clearly brilliant to put that clip on the banana! That A. she is so darn cute! A is so girly! I love it! They really do watch every single thing, don't they?